This PK Silesia Hand Painted Floral Porcelain Serving Tray is in excellent condition with no chips, cracks, or hairlines. The Silesia Hallmark on this one is the Eagle stamped before use of the orb and sceptor or the tent mark. 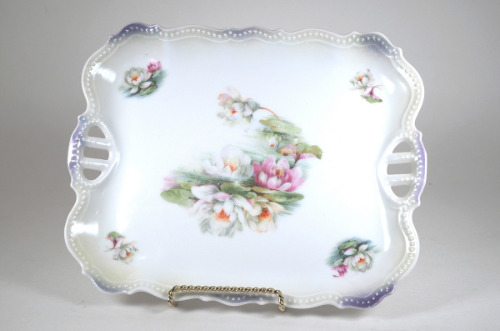 That places this dish between 1879-1914. the Hallmark is quite clear and the floral painted designs are very detailed and intricate in light pastel colors. An amazing dish for the Made in Germany Antique Dinner & Servingware collector. IMPORTANT SHIPPING NOTE: This dish will ship very, very carefully packed, double boxed and USPS Priority Mail for safe and faster delivery to your doorstep! Our Shipping costs include Tracking Numbers so you may track your purchase.